The AMD A9-9420 is a 7th generation (Stoney Ridge) dual core Accelerated Processing Unit for entry-level notebooks. Stoney Ridge is the successor of the Carrizo architecture and the design is almost identical. This accelerated processor (APU) has a base clock speed of 2.9 GHz but with Boost speed of 3.5 GHz. The single-core performance is pretty good because of the high maximum clock of up to 3.5 GHz, the single-core performance is pretty good. The multi-core performance on the other side is lower when compared to the Bristol Ridge models. With regards to older Carrizo-L/Beema quad-cores, the APU will still perform pretty well. The AMD A9-9420 SoC (System on a Chip) is manufactured using 28 nm technology and includes a Radeon R5 (Stoney Ridge) GPU, a memory controller that supports DDR4-RAM, in this case up to 2133 MHz; H.265 video engine and chipset with all I/O ports. 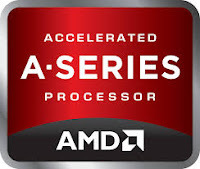 AMD A9-9420 PassMark. The higher the Score the better the processing performance. The integrated GPU in this SOC is Radeon R5 GPU which has 192 active shader units (3 compute cores) clocked at up to 800 MHz. and equipped with three cores from the third GCN generation. Only older and simple games will run smoothly with this GPU. The TDP – Thermal Design Power of this SOC is about 10 to 25 watts. It supports 64 bit technology and hardware virtualizations like AMD-V. This SOC was announced last June 1, 2016. 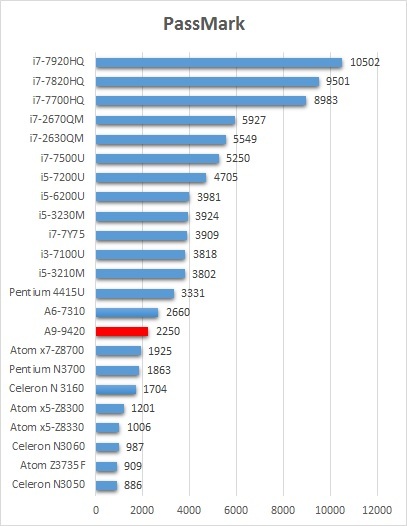 The AMD A9-9420 has a PassMArk CPU mark of 2250 which is more powerful compared to Pentiun N3700 with a score of 1863; Celeron N3160 with a passmark score of 1704; and Atom Z3735F with a score of 909; but less powerful than Core i3-7100U and A6-7310 with a score of 2660.